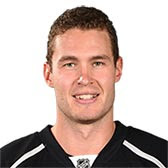 The Los Angeles Kings have activated defenseman Brayden McNabb from injured reserve, Kings President/General Manager Dean Lombardi announced on Dec. 29. The 6-4, 212-pound native of Davidson, Saskatchewan appeared eight games earlier this season for the Kings, where he registered two goals (2-0=2), tying his career-high for a single season. He has missed 26 games thus far with an upper-body injury sustained on Oct. 29 at STL. Selected in the third-round (66th overall) of the 2009 NHL Entry Draft by Buffalo, McNabb has appeared in 197 career NHL games with Buffalo and Los Angeles, collecting 48 points (7-41=48), a plus-25 rating and 176 penalty minutes.